Cancer prevention trials using different types of antioxidant supplements have been carried out at several occasions and one of the investigated compounds has been the antioxidant N-acetyl-L-cysteine (NAC). Studies at the cellular level have previously demonstrated that a single supplementation of NAC induces a ten-fold more rapid differentiation in normal primary human keratinocytes as well as a reversion of a colon carcinoma cell line from neoplastic proliferation to apical-basolateral differentiation . The investigated cells showed an early change in the organization of the cytoskeleton, several newly established adherens junctions with E-cadherin/β-catenin complexes and increased focal adhesions, all features characterizing the differentiation process. In order to investigate the molecular mechanisms underlying the proliferation arrest and accelerated differentiation induced by NAC treatment of NHEK and Caco-2 cells in vitro, we performed global gene expression analysis of NAC treated cells in a time series (1, 12 and 24 hours post NAC treatment) using the Affymetrix GeneChip™ Human Genome U95Av2 chip, which contains approximately 12,000 previously characterized sequences. The treated samples were compared to the corresponding untreated culture at the same time point. 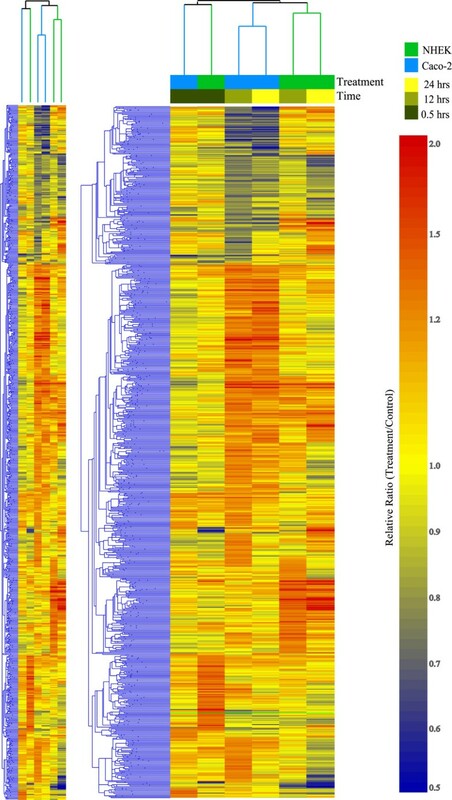 Microarray data analysis revealed an increasing number of differentially expressed transcripts over time upon NAC treatment. The early response (1 hour) was transient, while a constitutive trend was commonly found among genes differentially regulated at later time points (12 and 24 hours). Connections to the induction of differentiation and inhibition of growth were identified for a majority of up- and down-regulated genes. All of the observed transcriptional changes, except for seven genes, were unique to either cell line. Only one gene, ID-1, was mutually regulated at 1 hour post treatment and might represent a common mediator of early NAC action. The detection of several genes that previously have been identified as stimulated or repressed during the differentiation of NHEK and Caco-2 provided validation of results. In addition, real-time kinetic PCR analysis of selected genes also verified the differential regulation as identified by the microarray platform. NAC induces a limited and transient early response followed by a more consistent and extensively different expression at later time points in both the normal and cancer cell lines investigated. The responses are largely related to inhibition of proliferation and stimulation of differentiation in both cell types but are almost completely lineage specific. ID-1 is indicated as an early mediator of NAC action. Most human cancers arise in epithelial cells, underlining the importance of understanding the molecular biology of cancer and the complex balance of proliferation and differentiation in this cell type. Increased knowledge of these processes may provide unique targets for the future development of pharmacotherapy aiming at halting or reversing metastasis and cancer growth. N-acetyl-L-cysteine (NAC) is a membrane permeable aminothiol that functions as a nucleophilic ROS scavenger and antioxidant as well as a precursor of intracellular cysteine and glutathione (GSH). The reduced cysteine represents the active form, as opposed to the inactive oxidized cystine dimer. To date, NAC is used as a mucolytic and as acute treatment of fulminant hepatic failure following paracetamol poisoning. However, cancer preventing and therapeutic effects have also been suggested. In particular, NAC has been demonstrated to induce anti-proliferative and differentiating effects in normal human epidermal keratinocytes (NHEK), as well as in the epithelial colon cancer cell line Caco-2 . Primary normal human epidermal keratinocytes (NHEK) undergo spontaneous terminal differentiation over 30 days in culture. However, if supplemented with 2 mM NAC 24 hrs after seeding, an accelerated differentiation process can be observed. Three days post NAC exposure, differentiation of NHEK is demonstrated by an increased number of intercellular junctions, basal localization of cytokeratin and apical localization of actin determined by scanning electron micrographs of cells and sub-structures and high resolution confocal fluorescence immuno micrographs of for example β-catenin, E-cadherin, actin and cytokeratins. Furthermore ceased proliferation can be demonstrated by 3H thymidine incorporation without accompanying apoptosis experimentally verified by properdium iodide labelling and flow cytometry. Interestingly, an epithelial colon cancer cell line responded in analogy with the normal epithelial cells. Caco-2 differentiate spontaneously over a period of around 25–30 days in culture . However, when a single supplement of 10 mM NAC was given to Caco-2 cells 24 hrs after seeding, the proliferation decreased and the cells progressed to a differentiated state in three days without any sign of apoptosis . Here the differences in gene expression was studied overtime for both NHEK and Caco-2 cells using microarray technology with subsequent confirmation of a selected set of genes. The results are discussed from the perspective of accelerated differentiation and growth arrest. Normal human epidermal keratinocytes, NHEK (Cambrex, San Diego, CA), plated at a density of 8 × 103 cells/cm2, were grown in KGM® medium plus KGM® SingleQuots® (Cambrex). The Caco-2 human colon carcinoma cells were seeded at a density of 9 × 103 cells/cm2, grown in Dulbecco's modified Eagle minimum essential medium (DMEM, GIBCO Labs, Grand Island, N.Y.), supplemented with 10% (v/v) heat-inactivated fetal calf serum (GIBCO Labs), L-glutamine (2 mM), penicillin (50 IU/ml) and streptomycin (50 mg/ml). The N-acetyl-L-cysteine (NAC, Sigma Chem. Co., St Louis, MO) stock solution (20 mM in KGM and 100 mM in DMEM) was stored at 4°C in the dark and used within 1 week from preparation. Twenty-four hrs after seeding, filter sterilized NAC solution was added to the cell cultures to a final concentration of 2 mM and 10 mM in NHEK and Caco-2 respectively. The concentrations were selected after performing a dose-dependent inhibition analysis for each of the two cell types . Cells grown on coverslips were fixed with 2.5% glutharaldehyde in 0.1 M Millonig's phosphate buffer (MPB) at 4°C for 1 hr. After washing in MPB, cells were post-fixed with 1% OsO4 in the same buffer for 1 hr at 4°C and dehydrated in increasing acetone concentrations. The specimens were critical-point dried using liquid CO2 and sputter-coated with gold before examination on a Stereoscan 240 scanning electron microscope (Cambridge Instr., Cambridge, UK). From the normal (NHEK) cells, RNA was obtained from cultures grown for 1, 12 and 24 hrs after NAC treatment as well as from untreated cells at the same time points. Replicates at the level of individually performed cDNA synthesis were used for hybridisation in duplicate for the 1, 12 and 24 h time points except for one fall out of a 24 hrs post NAC treated sample. RNA was extracted from both treated and non-treated cancer (Caco-2) cell cultures at 1, 12 and 24 hrs. Biological replicates were used for hybridisation in a duplicate fashion for both treated and non-treated samples. The total RNA was extracted from cell cultures using Trizol (Gibco BRL, NY, USA) according to the manufacturers instructions. Thereafter mRNA was extracted by oligo dT Dynabeads (Dynal, Oslo, Norway) and the quality of mRNA was validated using the Bioanalyzer 2100 (Agilent technologies, Waldbrunn, Germany). A total of 8 micrograms of mRNA from each sample was used to perform cDNA synthesis. Following in vitro transcription, the biotin labelled cRNA was fragmented and a total of 15 micrograms were subsequently hybridised and analysed on the Affymetrix GeneChip™, all according to the manufacturers instructions (Affymetrix, Santa Clara, USA) with scanning performed on the GeneArray 2500A Scanner (Affymetrix, Santa Clara, USA). The MAS 5.0 software package (Affymetrix Inc.) was used to compute cell intensity files (.cel) for each chip. For the purpose of inspection of parameters important to quality control, chip files (.chp) were also generated for each chip using the statistical expression algorithm. Next, individual probeset intensity values were computed based on the cell intensity files using the RMA algorithm within the Bioconductor package. All data was analysed in three separate batches (2 separate sample preparation batches for the Caco-2 cell line and one for NHEK cell line. Each batch also included RNA samples obtained from 30 min, 3 hrs and 48 hrs treated and untreated cell cultures which are not presented in this manuscript). The RMA background correction, quantile normalization, only PM probe correction and a median polishing were applied. Next, data probeset intensities from each sample were converted to a biological fold ratio between the treated and control sample. To generate the ratio, signal intensities of each treated sample were divided by the control sample intensities for each corresponding time point, separately within each RMA batch. Because of a missing 24 hrs control for NHEK cell line due to fallout, time point 12 hrs control was used instead (detailed investigation showed that control samples at each time point were extremely similar to each other, rationalizing this choice). The average of replicates for each time point in two cell lines was used in the downstream analysis. Due to the quality control issues encountered with time point 24 hrs NHEK cell line, only one replicate was used. The standard deviation statistics was calculated using the Global Error Model based on deviation from one (GeneSpring, Silicon Genetics). A final total of 6 conditions were generated (1, 12, 24 hrs time points for NHEK and Caco-2). The MIAME compatible dataset is made available at the ArrayExpress expression data repository at EMBL. In order to identify genes that show significant changes during treatment we searched for genes that show significant up- or down-regulation in treatment relative to the control, in at least one of the time point for one of the cell lines (filtering was done using the t-test p-value < 0.01, indicating significant deviation from the control value or from the ratio of 1). Two-way hierarchical clustering of genes and conditions was performed using the set of pre-filtered genes (2054) and Standard correlation. In order to identify genes with significant NAC treatment response at each time point for each cell line we applied a two-step filtering based on the t-test p-value of less than 0.1 (indicating statistically significant changes from the control value), and a biological fold cut-off of 1.5 fold (up or down). A total of 6 genelists (3 for each cell line) was produced and visualized graphically for common distinct patterns. Data filtering and visualization was performed using GeneSpring (Silicon Genetics). To assess the overrepresentation of functional groups, according to Gene Ontology, the publicly available tool EASE (v2.0) was used . Validation of microarray results was performed by quantifying relative mRNA expression levels of several genes of interest. Two RT-PCR formats were used for the investigated genes. The first relied on primers and TaqMan probes obtained from Applied Biosystems and their Assay-on-demand system and the second approach was based on in-house designed primers and SYBR green detection. The assays used either the glyceraldehyde-3-phosphate dehydrogenase (GAPDH) or the transferrin receptor (TFR) as the endogenous internal reference gene. For the first method, cDNA synthesis was performed using SuperScript™ III (Invitrogen) in a 20 μl reaction containing: 1x first strand buffer, 5 mM DDT, 40 U RNasin (Promega), 5 μg total RNA, 200 U SuperScript™ III, 250 mM oligo(dT)20 primer, 0,5 mM dNTP each dATP, dGTP, dCTP, dTTP. Primer, total RNA and nucleotides were heated to 65°C for 5 min and subsequently cooled on ice for 1 min. After addition of the other reagents the samples were incubated at 50°C for approximately 60 min. Finally, the reaction was inactivated by heating to 70°C for 15 min. Assays-on-Demand (Applied Biosystems), containing gene specific primers and probes labelled with 6-carboxyfluorescein (FAM) at the 5' end and with 6-carboxytetramethylrhodamine (TAMRA) at the 3' end for the following genes: GAPDH (Genbank nb. BC029618), MMP9 (J05070), AKR1C3 (D17793), AQP3 (N74607), PLAT (M15518), HBP1 (AF019214), PTGS2 (U04636), ERBB3 (M34309) and PNRC1 (U03105) (see Table 3), were used together with TaqMan Universal PCR Master Mix (Applied Biosystems) in the TaqMan real time PCR reaction as described by the manufacturer. 25 μl reactions were done in 96-well plates. Amplification and detection was carried out using the iCycler iQ Multicolor Real-Time PCR Detection System (Bio-Rad Laboratories, Hercules, CA, USA). All samples were run in triplicate. Relative gene expression levels measured by real time kinetic PCR in Caco-2 and NHEK cells after NAC treatment as compared to untreated cells. Significant fold change: <0.5 for down regulated and >2.0 for up regulated genes, respectively. na = not analysed; nd = no data. * Taqman RT-PCR was done on these genes using Assays-on-demand (Applied Biosystems). GAPDH was used as a reference gene. **SYBR green RT-PCR was done on these genes using in house designed primers. Transferrin receptor was used as a reference gene. For the second method, in-house designed gene-specific primers for six human transcripts (Transferrin receptor (TFR): NM_003234 (5'-TCCCTAGGAGGCCGTTTCC-3'and 5'-GCCTACCCATTCGTGGTGAT-3), COX-2: NM_000963 (5'-GCATTGGAAACATCGACAGTGT-3'and 5'-TGACGTCTTTTTACTTGAATTTCAACTTATAT-3); NDRG1: NM_006096 (5'-CCAGTGCGGCTGCCAG-3'and 5'-TTCCTATGAGAAAATCCACGGTG-3); TP53: NM_000546 (5'-CCTTGAGGGTGCCTGTTCC-3'and 5'-CCCTCTACCTAACCAGCTGCC-3');CDH1: NM_004360 ('5'-TGAAGACCTTTAATGGCTTCCC-3'and 5'-CACACTTACTCAGAACAAGTCACTGG-3'); HSPB1: NM_001540) (5'-AAAATCCGATGAGACTGCCG-3' and 5'-GCACAGCCAGTGGCGG-3') were designed using the Primer Express software (Applied Biosystems, Foster City, CA, USA). Real time RT-PCR analysis was performed in triplicate using ds cDNA synthesized from mRNA obtained from the investigated cells. All PCRs were performed at 60°C annealing temperature and the TFR gene was used as internal standard. A PCR mastermixture was prepared using the SYBRGreen PCR Core Reagents (Applied Biosystems, Foster City, USA) and aliquoted into microplate wells together with 1 μl template and 5 pmol of each primer for a final volume of 25 μl per reaction. The iCycler (Bio-Rad) was used for PCR and detection of fluorescent signals. Standard curves (CT versus log concentration) were generated for each primer pair using duplicate cDNA samples in a series of consecutive 5-fold dilutions. Efficiency calculations (E=(10^(-1/amplificationslope)-1) were performed to validate compatibility of investigated genes with the internal control. The compatibility of all pair-wise compared amplification efficiencies were confirmed with a maximal deviation of 10% (data not shown). The specificity of all individual amplification reactions was confirmed by meltcurve analysis (data not shown). The relative mRNA expression levels of the target genes in each sample were calculated using the comparative CT method. The CT value was defined as the number of PCR cycles required for the fluorescence signal to exceed the threshold value. CT values were defined as the absolute value of the difference between the CT of the target RNA and the Ct of the housekeeping gene RNA for each sample. The level of significance was set to a 2-fold relative difference between samples, i.e. significant fold change 0.5 < 2-ΔΔC T > 2 for down- and up-regulated genes respectively. The aim of this work was to study the molecular effects of the antioxidant N-actetyl- cysteine (NAC) on proliferating cells, by gene expression analysis using the Affymetrix GeneChip platform. Previous studies on cell culture systems, demonstrated mainly by morphological and biochemical data, have indicated that NAC addition stimulates proliferating cells to go into differentiation phase . Figure 1 displays a scanning electro micrograph image of the cell types tested and demonstrates the morphological shift from proliferating to differentiating cells after addition of NAC. We have performed a microarray-based gene expression analysis of the human colon carcinoma cell line (Caco-2) and normal human epidermal keratinocytes (NHEK) over time (1, 12, and 24 hrs) after addition of NAC, compared to untreated, control samples at the same time points. Data obtained from GeneChip analysis were processed using the RMA analysis approach and samples were normalized to their corresponding controls. Filtering was done based on two criteria (p-value < 0.1 and >1.5 fold up-or down-regulation) for each time point. The labelling and hybridisation was done in duplicate, except at 24 hrs NAC treatment of NHEK, where a single measurement was made. Gene lists of up- and down-regulated genes at each time point for NHEK and Caco-2 (1, 12, 24 hrs) were generated. In addition, time points within each cell type were analysed to identify similarities/differences among early and late time-point responses. Any results that produced zero genes were skipped. A summary of the top ten differentially expressed genes in Caco-2 and NHEK, at all time points, is depicted in additional files 1 and 2. The complete lists of differentially expressed genes are accessible as additional datafiles 3 and 4 or at http://biobase.biotech.kth.se/NACmicroarray. There were no general differences in the number of transcripts detected in treated as compared to untreated samples in any of the cell lines. 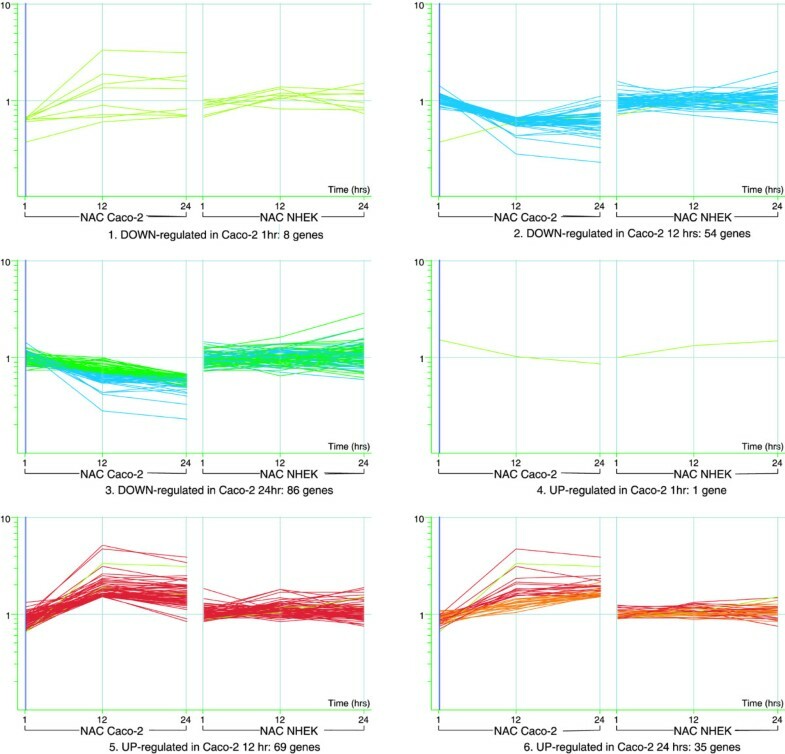 Following NAC induced differentiation in Caco-2 and NHEK, 253 and 414 targets, respectively, were significantly differentially expressed across the time series, according to above statistical criteria (Table 1). Generally, for both cell types, the amount of significantly up/down-regulated genes is limited to < 200 genes after consideration of multiple appearances. 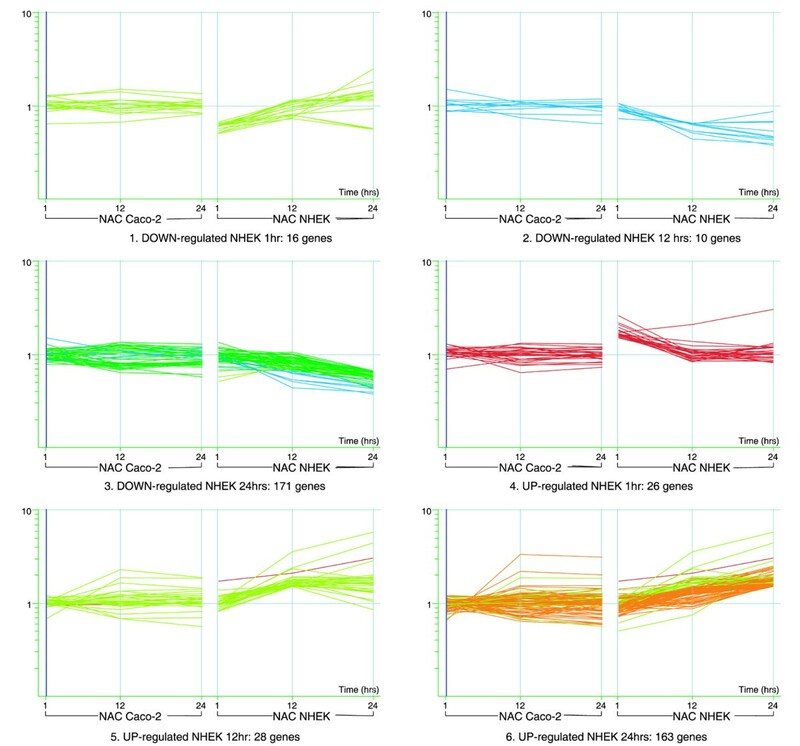 In Caco-2, a tendency towards more down-regulated genes was identified, while in NHEK, the numbers of genes induced was approximately equal to those repressed (Table 1). Number of genes induced/repressed at each time point. Both Caco-2 and NHEK exhibit a relatively limited early response at 1 hr, followed by an increasingly stronger response at 12 and 24 hrs. The initial response could be characterized as transient, since most of the genes induced/repressed initially either changed in the opposite direction later on, or simply went back to normal expression levels. The induced/repressed genes in the two cell types are generally quite different despite their morphological similarities after NAC treatment. This is for example demonstrated in that most of the genes induced/repressed in Caco-2 show no change in expression levels in NHEK and vice versa (see below). A direct comparison of the corresponding differentially expressed genes is also provided. The general trends for Caco-2 cells are depicted in Figure 2 based on the collection of genes that passed the set criteria. Matrix view of significantly affected genes. Genes induced/repressed in Caco-2 relative to control and their corresponding expression profiles in NHEK. The color is specific for genelist of affected genes at each time point (unless these are the same genes as from one of the earlier time points). Clearly, the early response at 1 hr is very limited (1,8 genes in Caco-2). There are also almost no genes induced/repressed at 1 hr that continue the trend at later time points – indicating an early transient response. This is markedly different for 12 hr and 24 hr time points that show many common genes. It is also clear that many genes affected by NAC treatment in one cell line don't show the same response in the other cell line. The graph shows the behaviour of genes induced/repressed in Caco-2 across the time courses in both cell types (signal represents the fold difference between each treatment and the average of corresponding controls). As indicated above, there is a small transient change at 1 hr, and a more significant change, taking place at later time points. In particular, it is observed that the majority of genes repressed at 12 hrs continue their trend at 24 hrs (blue lines correspond to 12 hrs genes, dark green line corresponds to 24 hrs genes only). Similarly, many genes up-regulated at 12 hrs continue the trend at 24 hrs (red line 12 hrs genes, orange line 24 hrs genes only). (Gene lists showing multiple appearances in the same cell type, Caco-2, at more than one time point can be found in additional file 4 or at http://biobase.biotech.kth.se/NACmicroarray). The expression pattern of the corresponding genes in the other cell system NHEK shows weak or no correlation. Table 1 represents the number of genes induced/repressed at each time point for Caco-2 cells and NHEK cells, including those with changes across multiple time points. Again, it is evident that early activity (1 hr) is limited and quite different from the activity at later time points and that few genes induced/repressed early on (1 hr) continue their trend at later time points (Figure 2). This has also been observed after 24 and 48 hrs using another microarray platform based on spotted cDNA arrays (data not shown). The NHEK cells were analysed in a similar manner (see additional file 3 or http://biobase.biotech.kth.se/NACmicroarray). The t-test p-value for NHEK 24 hrs is not included, since there were no treatment replicates; an error model was used instead. However, some of the values in the error model do not correspond, in this case, to other t-test p-values and are therefore not included. A similar trend to that described for Caco-2 takes place in these cells, with early transient response at 1 hr, followed by a more extensive response at later time points (12, 24 hrs) as demonstrated in Figure 3. Again, the genes active at 1 hr do not appear to be active at later time points (except for a few genes in each case). On the other hand, genes active at 12 hrs also appear active in the same direction at 24 hrs. Table 1 includes the exact numbers of induced/repressed genes. Matrix view of significantly affected genes. Genes induced/repressed in NHEK relative to control. The color is specific for genelist of affected genes at each time point (unless these are the same genes as from one of the earlier time points). Also in these cells, quite a limited early response is observed at 1 hr (16 and 26 genes in NHEK). There are almost no genes induced/repressed at 1 hr that continue the trend at later time points -indicating an early transient response. This is markedly different for 12 hrs and 24 hrs treatments that show many common genes. It is also clear that many genes affected by NAC treatment in one cell line don't show the same response in the other cell line. Comparisons of NAC treated Caco-2 and NHEK show that the responses are very different. Only a few genes were regulated similarly in both cells (Table 2). Genes common in both Caco-2 and NHEK at the different time points. Even if we consider that statistical considerations (filtering etc.) inaccurately prevented a number of genes from overlapping in analysis of two cells, the clustering in Figure 4 show that the responses are indeed very different. The hierarchical clustering is based on filtered genes (significant change in at least one time point) for all time points and each cell type. At the time point 1 h after treatment, there is no cell-specific clustering. Actually, both cell types are in the same cluster for 1 hr. It is in the later time points, with much stronger and distinct response, that the cell-specific clusters form (blue = NHEK, green = Caco-2). Hierarchical clustering diagram at 1, 12 and 24 hrs. A set of 2054 genes which show significant changes in expression in at least one of the time points in either of the two cell line clustered using the standard correlation. Cluster of the corresponding time points for each cell line indicates very close similarity of NHEK and Caco-2 at time point 1 hr, at which the NAC effect is not yet pronounced (both cell lines form a tight separate cluster at 1 hr). However, during the later time points the changes are much more significant and the differences between Caco-2 and NHEK become very pronounced as well (each cell line forms a separate cluster that includes both 12 and 24 hrs time points). A set of genes indicated to be differentially expressed were chosen to validate the analysis (Table 3). Additional time points were also used in this analysis. The genes represented both markers of proliferation and motility as well as new candidates in these and other related processes and in many of these cases the differential gene expression could be confirmed. In order to perform Gene Ontology analysis of significantly regulated genes in Caco-2 and NHEK we created combined lists of genes up- and down-regulated at any of the three time points. In order to statistically assess the overrepresentation of each category we used the publicly available tool EASE. For each cell line, the down-regulated genes were assessed for gene ontology enrichment relative to the up-regulated genes in the same cell line, within the universe of all genes being the Affymetrix U95aVer2 probe set. The final table of gene ontology groups was selected based on the number of overlapping genes, EASE score, illustrating common biological mechanisms or pathways (e.g. motility, cell division). The results of analysis in both cell lines indicate a strong tendency towards differentiation by halting cell proliferation and related processes, Table 4 (NHEK) and Table 5 (Caco-2). However, the mechanisms inhibiting cell proliferation in NHEK and Caco-2 cell lines appear to differ significantly. As seen from the two tables, genes responsible for proliferation are shut down in both cell lines, with NHEK showing a stronger direct proliferation effect (more genes are shut down). This effect, however, can be explained by a considerably higher number of significantly regulated genes identified in NHEK vs. Caco-2. Furthermore, the mechanism of inhibiting proliferation in NHEK appears to be directly related to the shut down of processes such as nuclear division, mitosis, cytokinesis etc. – all required for cells to divide and proliferate. In Caco-2, on the other hand, the mechanism appears to involve cell structure inhibition, through the shut down of genes involved in adhesion and cytoskeleton changes. Finally, the motility processes critical to Caco-2 inhibition of proliferation are affected in NHEK, while cell division seems to be affected to a lesser degree in Caco-2. in Caco-2 due to a large initial list size). Deregulation of proliferation is a characteristic of tumorigenesis and therapeutic approaches for cancer treatment targets apoptosis, cell cycle arrest and differentiation. NAC has been shown to induce a multitude of molecular changes related to tumorigenesis . Recently, NAC has been demonstrated to inhibit apoptosis [5, 6], possess anti-inflammatory activities  and inhibit proliferation . Here, we have monitored the reflection in global gene expression profiles of the transition from proliferation to a differentiated state in normal and cancer cells in vitro, as induced by NAC. Two out of three previous studies of the global gene expression that accompanies the spontaneous differentiation of Caco-2 report a general down-regulation of gene expression in differentiated cells as compared to the proliferating counterpart [9–11]. A similar, but not as pronounced, trend is reflected in the number of genes differentially expressed following NAC induced differentiation in Caco-2. The expression level of 253 targets in Caco-2 and 414 in NHEK were statistically differentially expressed at different time points. Multiple appearances of differentially regulated transcripts were common, resulting in detection of totally less than 200 unique genes, respectively. This is fewer than expected in comparison to previous reports on differential regulation during spontaneous Caco-2 differentiation and probably due to the difference in stringency of the algorithms used for data analyses (MAS 4.0 vs RMA), rather than related to functional biological discrepancies. In both data sets, the early responses were relatively limited and appeared to be transient, indicating that a large part of initial immediate early events occur at the level of translation and post-translational modifications. The nature of initial regulatory events is also expected to be transient due to feedback inhibition as well as to a restricted number of NAC induced mechanisms. Interestingly, significant transcriptional down-regulation of the inhibitor of differentiation 1 (ID-1) was found at 1 hr in both Caco-2 and NHEK, suggesting a common mechanism of NAC induced differentiation and inhibition of proliferation in NHEK and Caco-2 epithelial cells. Analysis of ID-1 expression levels by real-time quantitative PCR confirmed the suppression of the transcript in both cell types (Table 3). ID-1 has been demonstrated to bind helix-loop helix transcription factors, preventing them from binding DNA . In particular, ID-1 has been shown to be required for G1 progression, and its constitutive expression inhibited the lineage commitment and differentiation in B-cells [13, 14]. Previous reports have also shown that ID-1 is a negative transcriptional regulator of CDKN2A (p16/p14/p19), which induces G1 arrest through the inhibition of Rb phosphorylation by cdk -4 and -6 . Overexpression of ID-1 was also reported in psoriatic involved skin . Inhibitors of histone deacetylase activity are emerging as a potentially important new class of anticancer agents. The cell cycle blockade and differentiation caused by such a drug, trichostatin A, caused decreased levels of ID-1 consistent with cell cycle senescence and differentiation of A2780 ovarian cancer cells . Vitamin D is also known to promote differentiation and was shown by others to down-regulate ID-1 through a suppressive vitamin D response sequence in the 5'of the gene . The ID-1 expression is regulated by a protein complex containing the immediate-early response gene EGR1 . The growth regulatory properties of EGR1 have been found to involve coordinated regulation of TGF-β1 and fibronectin (FN1). The resulting proteins are secreted and lead to increased expression of plasminogen activator inhibitor-1 (PAI1). Both the secreted FN1 and PAI1 functions to enhance cell attachment and normal cell growth . We detect the induction of both fibronectin and PAI1 in NHEK cells at both 12 and 24 hrs, suggesting a role of EGR1 pathways in the NAC mediated mechanism at least in this cell type. Other interesting down-regulated genes at 1 h after NAC treatment in NHEK included for example regulated in development and DNA damage response 1 (REDD1), squamous cell carcinoma antigen 1 (SCCA1), highly expressed in cancer (HEC), s100a9 and kallikrein 7 (also termed stratum corneum chymotryptic enzyme – SCCE). REDD1 has previously been shown to be down-regulated in differentiating primary human keratinocytes and ectopic expression inhibits in vitro differentiation . The suppression of SCCA1 has been demonstrated to inhibit tumour growth , HEC expression is increased in tumours  and S100A9 has been found to be up-regulated in psoriasis patients displaying keratinocyte hyperproliferation and altered differentiation . SCCE has been suggested to play a role in desquamation and its up-regulation is associated with poor prognosis of ovarian and breast cancer [25, 26]. A number of interesting up-regulated genes, such as activin A and WEE1, were also identified in NHEK 1 hr after NAC treatment. Over expression of WEE1 inhibits cell cycle progression by inactivation of the CDC2/cylin B complex , while activin A is a member of the TGF-β family of cytokines which is known to promote growth arrest and differentiation in several tissues including intestinal epithelia [28, 29]. In fact it was first identified as a protein that exhibits a potent differentiation-inducing activity . In Caco-2, the proto-oncogene fos and the transcription factor HNF3A, which have been observed to be amplified in human malignancies , was two of the identified genes being repressed at 1 hr after NAC treatment. A single gene, integrin alpha 2, was found up-regulated at this time-point. It is clear that these data collectively describe molecular changes associated with the mediation of a differentiated epithelial phenotype. A large part of the differentially expressed genes have clear implications in withdrawal of mitogenic signals and in promotion of growth arrest. Multiple signalling pathways are suggested to be involved. Progressively more genes were affected in both cell types, and many showed similar trends in direction, over later time points. Cluster analysis revealed tightly linked genes between the 12 and 24 hrs time points in the same cell type and genes with such multiple appearances are potentially more strongly implicated in the differentiation process. In NHEK cells, for example the down-regulated mitogens neuregulin 1 (heregulin) and melanoma growth stimulatory activity (MGSA) , belong to this group. MGSA belongs to a super family of chemochines, including IL-8, which is involved in inflammatory processes. Heregulin is known to activate the oncogenic ERBB2 receptor . Cdc-6, which are regulated in response to mitogenic signals, binds PCNA and is required for initiation of DNA replication , was also repressed at both 12 and 24 hrs after NAC treatment, implying programs involving withdrawal of mitogenic factors as important mechanisms for NAC mediated inhibition of proliferation and increased differentiation in NHEK cells. The expression of Topoisomerase II (TOP2) was also repressed, confirming results obtained in NAC treated CHO cells . Topoisomerases control and alter the topologic states of DNA, and the relaxation activity of TOP2 is essential for productive RNA synthesis on nucleosomal DNA . The list of correspondingly important up-regulated genes in NHEK was extensive and included activin A, transglutaminase 2 (TGM2), ErbB3 (HER3), matrix metalloproteinase 9 (MMP-9), fibronectin (FN! ), PAI1 and TGFβ among others. Notably, activin A was the only gene found to be up-regulated at all investigated time points, demonstrating a sustained growth inhibitory and differentiation promoting signal. TGM2 catalyses cross-linking of proteins, demonstrates G-protein function in receptor signalling  and was recently reported to phosphorylate IGFB3 . IGFB3 in turn has a major role in regulation of proliferation as a growth inhibitor through IGF2 binding and alternative IGF2 independent pathways . Thus implicating potential regulatory functions of TGM2 in proliferation and differentiation. Surprisingly, ErbB3, which promotes proliferation through the Wnt signalling pathway, was also up-regulated. RT-PCR could confirm the induction (Caco-2, 12 hrs) and a study investigating spontaneous Caco-2 differentiation is also in agreement with our data on up-regulation . In contrast, a recent publication reported its up-regulation in breast cancer , suggesting a dual role of ERBB3 in cell cycle regulation. The induction of MMP9, confirmed by RT-PCR (48 h NHEK) is in additional contrast to our observations of NAC-induced cell differentiation and proliferation. MMP9 has been associated with angiogenesis, tumour progression and metastasis as mediated through degradation of the extracellular matrix (ECM)  and stimulation of hyperproliferation . However, tumours with low levels of MMP9 were found to be less differentiated. Thus, although MMP9 stimulates proliferation, it is also implied in positive regulation of differentiation . NAC has been proposed to inhibit activation of latent MMP9 protein in ECM reservoirs by removal of its propeptide and by competing for the zink ion which is necessary for enzymatic function . Hence, our data may imply that post-transcriptional regulation of MMP9 prevails over the transcriptional changes as the major control mechanism. A large number of multiple occurring differentially expressed transcripts were demonstrated in Caco-2, including intestinal trefoilfactor 3 (TFF3) and Aquaporin 3 (AQP3) among others. TFF3 has been shown to have a central role in the maintenance and repair of intestinal mucosa  and upregulation is expected during differentiation. Aquaporins (AQPs) are water channel proteins, important for the transport of water and other small proteins across the cell membrane . AQP1 has previously been shown to be involved in cell cycle control , suggesting that AQP3 may also have a role in the progression of cancer. AQP3 has been reported to be highly expressed in several types of stratified epithelial cells in rat, including the epidermis  and the differentiated cells of the gastrointestinal tract . The expression of AQP3 was reported to be up-regulated in differentiating Caco-2 cells , while expression was shown to be down-regulated in differentiating primary keratinocytes . In this study AQP appears to have a transient behaviour in Caco-2 cells with a repressed behaviour at initial time point and induced pattern at later time points (confirmed by RT-PCR), indicating a remodelling of cell membrane constituents. The genes repressed in Caco-2 included for example Cyclin D1, Inhibin beta B, BMP-2 and FHL-2. The D1 cyclin is involved in β-catenin-TCF signalling and its down-regulation induce G1 arrest . FHL-2 has been demonstrated to be a coactivator of β-catenin from cyclin D and IL-8 promoters in a colon cell line , suggesting that repression of FHL-2 may also repress growth. Inhibin beta and BMP-2 are members of the TGF family of genes. Inhibin beta is an antagonist of activin A activity and consequently represses differentiation and promotes growth . BMP-2 on the other hand, has been demonstrated both to induce apoptosis  and growth inhibition/differentiation . In contrast, another recent study demonstrated the ability of BMP-2 to enhance the growth of tumours . A vast number of additional interesting genes with potentially important roles in mediation and manifestation of the differentiated epithelial phenotype was identified as significantly induced or repressed in a single time point. As an example, up-regulation in NHEK after 24 hrs was seen for transcripts encoding CDKN2B (p15), which is believed to be an effector of TGF-β induced G1 arrest and inhibition of proliferation , and for CDKN1C, which is a p21 homologue and negative regulator of cell proliferation . Other up-regulated genes at this time point were the transcription factor Jun and BTG1. Jun was recently demonstrated to be a regulator of erythroid differentiation  and Jun B knock out mice have been shown to develop a proliferative disease resembeling human chronic myeloid leukemia . BTG1 has been proposed to belong to a family of antiproliferative genes . Up-regulation was also found for cadherin 13, a gene with growth inhibitory functions that is expressed in normal cells but not in the majority of human tumour cells of epithelial origin . While not identified by global transcript analysis, RT-PCR investigation revealed increased levels of E-cadherin in both Caco-2 (24 hrs) and NHEK (24 and 48 hrs), this in agreement with the previously reported immunohistochemical data  that showed increased staining of E-cadherin in NAC treated cells. In Caco-2 cells, the differentiation-related gene NDRG1, which is expressed during differentiation and down-regulated in colorectal neoplasms , was up-regulated at 12 hrs. This increase was also demonstrated by RT-PCR at 12, 24 and 48 hrs after NAC treatment. The induction of Cdx2 may also be a functional change, since reduced expression of Cdx2 has been shown to be important in colon tumorigenesis . Interestingly, in correlation with the controversial results from NHEK, an up-regulation of ErbB3 was identified in Caco-2 at 12 hrs. In addition, the oncogene myc was also up-regulated in contrast to the expected decrease. The down-regulation of Cox-2 and BMP-2 was also in concordance with NHEK data. In addition, the TGF-β family member BMP-4 was repressed. This correlates well with our results on repressed ID-1 expression, since both BMP-2 and -4 up-regulate ID-1 [64, 65]. 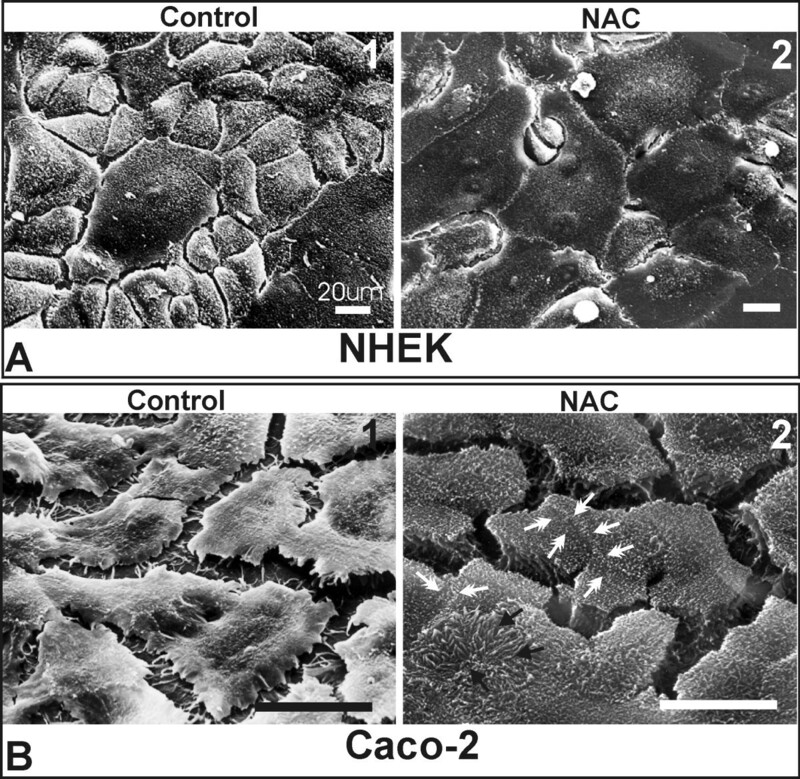 Hence, although induced by the same mechanism (NAC) and yielding the same end-stage of growth inhibition and differentiation, the processes in NHEK and Caco-2 are on the whole quite different. This is demonstrated by gene specific differences that result in lack of correlation between cell types at the same time point after treatment as identified by cluster analysis. This is furthermore supported by the Gene Ontology analysis, tables 4 and 5, indicating that the two cell lines achieve their differentiated states using two distinct mechanisms, this in concordance with previously observed effects of NAC treatment on cell morphology and growth arrest . It should be noted that apoptosis does not appear to act as a regulating mechanism, since only a very small proportion of apoptotic genes are affected in either direction (2 to 12 genes out of 317, in either direction). This is also supported by the previous study , which analysed apoptosis by propidium iodide labelling and flow cytometry. As additional testimony to the lineage specific differentiation programs, only very few genes were identified as being similarly regulated in both cell-types. These included ID-1, AQP3 and ErbB3 (as described above). Cox-2 was also similarly down-regulated in both cell types after NAC treatment. When investigating Cox-2 expression by RT-PCR we could confirm the down-regulation at 24 hrs in Caco-2 and identify an additional repression in NHEK at 1, 3 and 48 hrs after NAC treatment. Overexpression of Cox-2 has been shown to promote cell migration and invasion in Caco-2 cells  and to regulate colon carcinoma induced angiogenesis by production of angiogenic factors . In addition, epidermal differentiation is also affected by Cox-2 over expression. Cox-2 seems to prevent entrance into the postmitotic state, which is coupled to the switching on expression of differentiation-associated proteins, allowing keratinocytes to proliferate . In correlation with our data, a NAC mediated inhibition of Cox-2 expression have previously been demonstrated in colorectal cancer . Hence, it is likely that Cox-2 repression is a NAC specific event endorsing differentiation/growth arrest in both NHEK and Caco-2. HBP1 was also up-regulated in both Caco-2 and NHEK after 12 h of NAC treatment and RT-PCR could confirm an increase in Caco-2 at 12 and 24 hrs. This corresponds to previous findings, where HBP1 has been seen to have a negative effect on tumours. It has previously been established that HBP1 is a target of the retinoblastoma pathways [70, 71] and that HBP1 negatively regulates Wnt/β-catenin, thus inhibiting proliferation and suggesting that HBP1 may have a tumour suppressor function . Two additional proteins, putative 28 kDa protein and proline rich nuclear receptor coactivator-1 (PNRC1), were also identified as differentially expressed in both cell types. RT-PCR analysis was able to confirm an up-regulation of PNRC1 in Caco-2 24 hrs after treatment. However, these genes are not previously described and potential functions remain unresolved. A proportion of the differentially expressed transcripts were not possible to predict as being part of the differentiation context. For example, ErbB3, fos, TGFβI and myc were found to be expressed at higher levels in differentiated cells, in contrast to their roles in promotion of proliferation. Interestingly, a similar contrasting increase in fos and ErbB3 levels was found in normal colonic cells as compared to colorectal cancers in a SAGE study . It is important to note that spontaneous morphological and functional differentiation in Caco-2 have been demonstrated not to be coupled, with independent mosaic patterns of proliferating and differentiated cells present adjacent in the cell culture , which may in part explain some of the contrasting results. However, many of the detected differentially expressed genes in this study have previously been described as altered in differentiated epithelial cells. In NHEK cells we could for example confirm the expected increased expression of SPRR1B and SPRR2A. In Caco-2 the up-regulation of AQP3, NDRG1 and TFF3 were among the genes that validated the results from the global transcription profile analysis. Interestingly, several genes with major relevance in psoriasis have been found differentially expressed as a consequence of NAC treatment in the particular epithelial cells included in this study, for example S100A9, ID-1 and Cox-2. These findings could give a mechanistic background to the ongoing clinical studies being carried out based on empirical NAC treatment of patients having psoriasis. Alternative NAC signalling mechanisms at the level of proteins and metabolites may also be important. For instance the phospholipid modulator, platelet activating factor, has been demonstrated to induce differentiation and inhibit proliferation in colon cells , and inhibit proliferation in cultured human keratinocytes . Accordingly, we are performing supplementary proteome and metabolome studies. In addition, analyses of additional cell lines for finding a common pathway of molecular changes that result from NAC induced differentiation are being considered. Our data demonstrate that NAC stimulated differentiation induces a limited and transient early transcriptional change, followed by a more constitutive and extensively different expression at later time points in both NHEK and Caco-2 cells. The genes affected are to a large extent related to inhibition of proliferation and stimulation of differentiation, but the responses are almost completely lineage specific. This and further analysis of NAC mediated expression changes provide a description of the complex molecular mechanisms of sulphydryl reductant treatment and potential targets for the development of new drugs for treatment of proliferation related epithelial disorders. We kindly acknowledge The Knut and Alice Wallenberg Foundation, the Swedish Research Council, the Wallenberg Consortium North (WCN) for financial support, and the Nactilus AB, Malmö, Sweden (to LB-L, GG, EKK, TP). ACG participated in the design of the study, drafted the manuscript, coordinated and carried out real-time kinetic PCR and Affymetrix experiments as well as performed initial data processing and data analysis. IK performed data processing, statistical analysis and data analysis as well as assisted with the manuscript. EER performed real-time kinetic PCRs and assisted in drafting the manuscript. LBL, GG and EKK cultured cells and isolated totRNA. JL, TP, TL and MCR directed the teams that carried out this study.